Removing ticks from your cat may sound like something rather disgusting to have to do and yes it isn't that pleasant but it is an important cat care duty for any cat owner. If ticks are left untreated they can make your cat very sick indeed. Cat ticks are blood sucking parasites (related to the spider family), which attach themselves to your cat by biting hard and burying their head into the cats skin. They remain there until they bloated with your cat's blood before finally dropping off. Each stage needs to be preceded by a blood meal for them to move on through the cycle. What Do Ticks On Cats Look Like? 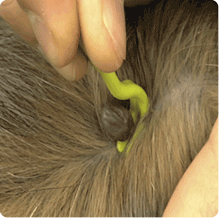 Ticks start off as being quite small, about the size of a pin head, but once they have gorged themselves on blood they swell to the size of a pea. It is only when they reach this pea size (takes a few days to a week), that they are noticed and are often mistaken for a wart as they are bluish / grey in color. 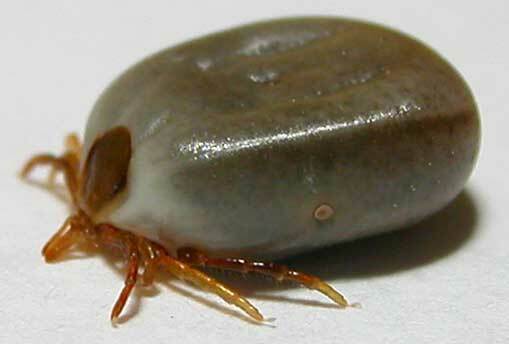 The sheep tick, Ixodes ricinus, also known as the deer tick or castor bean tick, this tick can also infest humans. 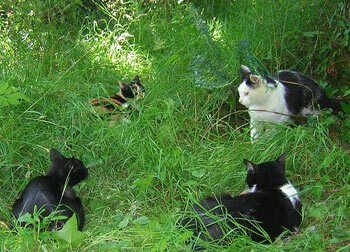 Cat ticks mainly live in damp areas such as heath land, woodland or moorland, in grasses and on plants. Although they can live in back gardens too. Once hatched they climb up grasses and plants to await the passing of an animal which it can attach itself to for its first meal. Tick bites are nasty and are both painful and harmful. So removing ticks as soon as possible will help relieve your cats discomfort sooner rather than later. Will A Tick Harm My Cat? Ticks on cats are definitely a problem for your cats health for several reasons:. Ticks are second only to the Mosquito for transmitting infectious disease to both animals and humans and so removing ticks and preventing their spread and removing ticks is vitally important. Detecting and removing ticks on your cat as soon as possible the better the outcome for your cat. So regularly check your cat’s fur and skin for small lumps and bumps which could be a tick attached to the body. Removing ticks, if found, should be done as soon as possible to help prevent any serious infections. Medical treatment should be sort as soon as possible if you suspect your cat has been bitten by a tick and is showing signs of ill health. If there are only one or two ticks on your cat you could try to remove them yourself. However it is important that when removing ticks you ensure that you get all of the tick out completely as sometimes the head can remain embedded in the skin and this will cause a serious infection (tick granuloma). If there are lots of ticks on your cat and you are unsure of how to remove them safely then you should get your vet to remove them for you. You can ask to be shown how to do it properly for yourself for future reference. There are many suggestions flying around on how to remove a tick from, burning them with a cigarette to covering them with butter to suffocate them. However these methods can cause further problems such as burning your cat to spreading the ticks toxins further. The only reliable way to make sure that a tick is removed completely is to remove the tick completely using special tick removers. The Tick Key. It is so easy to use and makes sure that all of the tick is removed painlessly and quickly. Your cat may be left with a little swelling or sore spot once the tick has been removed, this should go away after a few days. You could sooth the area with a mild antiseptic. If the swelling or soreness does not go away after a few days then seek medical treatment from your vet. The best way to protect your cat from ticks is to remove the tick’s habitat. So make sure all grass is always clipped short in your garden and that loose leaves and plant trimmings are disposed of. If at all possible keep your cats away from areas of tall brush or grasslands, difficult I know if your cat is a rambler. If you cannot prevent your cat from entering these areas, make sure you check them often for ticks on their body. There are spray on or spot on treatments that can be used on your cat which deters ticks from biting them. Check to see if the spot on flea treatment that you use for your cat also protects from ticks. Usually many of the top brands do also helps to protect your cat not obly from fleas but ticks too. 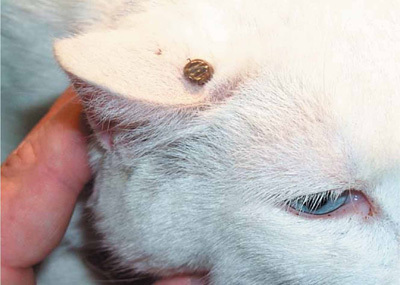 However I would suggest that even if you do use a preventative treatment it is always wise to check your cat regularly for these nasty little critters and ensure your cats health by removing ticks whenever you find them. Antiseptic treatment for all types of cuts, scratches, burns and insect bites. Soothing pain relief and healing aid are available in easy-to-apply Feline Rescue Spray.